In 1989, Alice Heath, a former public health worker, devoted her passion, time and energy to inspire the Santa Barbara community by founding a non-profit for men and women dying from HIV/AIDS. Heath House, as it was to be called, opened its doors at 18 East Sola to people who were not only dying at a young age, but facing ignominy and fear. Leading with truth and courage, Alice changed much of that. May her memory be for all of us a blessing. In the mid 1990s, Sarah Shoresman, already well into her 80's, matched her countless service hours to our Board and its vision with a financial gift. This enabled us to operate a second home, this time named Sarah House. And may her memory be for all of us a blessing. With the advent of powerful new medications, the mortality rate for people with AIDS dropped wonderfully and dramatically. Sarah House responded by expanding services to offer end-of-life care for low income and homeless men and women of the Santa Barbara community. Many had no one to stand with them at this final important and difficult time. Sarah House is located on Modoc Road, a corner piece of property which, when the weather is right, is able to feel the ocean breeze coming up from Hendry’s Beach. It is a lovely home, meticulously cared for by the Staff and Volunteers who want folks to be able to find a place of beauty in which to live out their last days. Far from being a “facility,” it is clearly a “home.” There is a living room with a piano and comfortable chairs and sofas. The dining room has a table large enough for family and friends to join us for a home-cooked meal. And the kitchen, big and sunny, is open around the clock. Sarah House has eight bedrooms, one for each Resident. On move-in days, nails are hammered into the wall, pictures are hung, mementos are put throughout the room. Some people even bring their favorite recliner. And so from the morning people awaken for the first time, they at once see in their bedrooms something of their lives, of who they are. And the photos and treasures give immediate clues about these people who are now trusting us to help them through the rest of their lives. 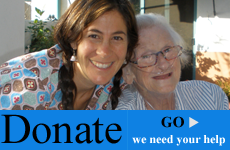 Local hospice organizations come by daily to support the medical needs of each Resident. There is a true and mutually-respected partnership between these organizations and our staff. Together we work to be certain that our Residents are as comfortable as possible, take medications on time, and have questions answered. Medical services are truly on-call and available at the dial of a phone. However, the heart of Sarah House is dedicated to the certainty that death is so much more than a medical event. To that end, the Sarah House Staff are on duty and dedicated to serve, to help and to accompany. They awaken folks in the morning and say goodnight in the evening. They cook and they clean. They drive and they sit beside. They hold hands and they listen. And through it all, they love.